Our resident medical expert, Scott, and a buddy of his recently started The Medicine Journal, where you can learn all sorts of interesting facts about all things medical related. Below is a sample article from their site. Have you ever seen the toenails of your grandfather and thought he might be a troll? Those yellow, misshapen and brittle nails tend to make small children cringe, and in response, he wears knee high black socks with sandals. Known as Onychomycosis, this unshapely blemish effects about 10% of the total population. 20% of people over 60, and 50% of people over 70 become victims. So what’s happening here? There can be several causes of your imperfect nails. The most common is a class of fungi known as Dermatophytes. Certain types of yeasts and nondermatophytic molds are also a frequent cause. Don’t think your nails are the only body part that can be affected by dermatophytes. When infecting the skin, they cause “ringworm” or “tinea”. They can also take up residence in your hair and follicles and cause what is known as tinea capitis. Dermatophytes, and the disease processes they cause, are quite unique in the world of living organisms and parasites. First, no living tissue is invaded by the fungi. Instead they colonize the dead layers of tissue that have large amounts of a protein called keratin. Hair, skin, and nails all have large amounts of keratin within them. Secondly, even though no living tissue is invaded, they can still illicit an allergic and/or inflammatory response. Thirdly, these types of fungi have evolved to the point that they’re completely dependent on human or animal infection for the survival and propagation of their species. To better understand how they cause our nails to become so deformed, let’s first look at how our nails grow and what they’re made of. Our nails consist of many different parts. The part we can see is known as the nail plate. Below the plate is the nail bed. 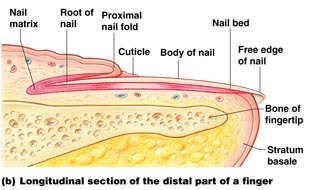 The white, half-moon shaped part, at the base of the nail, is called the lunula (also known as the distal matrix). The tissue over the top of the matrix is called the cuticle. The nail itself is grown primarily from the matrix (around 90%). The matrix consists of epithelial cells that grow and divide. Epithelial cells are the most common type of cells within the body, and are what make up your skin and hair. They primarily contain keratin. Once they begin to reach the end of their respective life cycles, the cells go through a process called keratinization, also known as cornification. When the cell dies, it loses its nucleus and other intracellular organelles. What is left over is hardened keratin. An enzyme known as Transglutaminase begins to enclose the keratin in an insoluble mixture of different proteins and fats. The end result is the hard nails we use to pick noses and give back scratches. Keratin is the main food source, of sorts, for dermatophytes. Once the keratin rich cells are infected by these fungi, they begin releasing sulfite. Studies have shown that growth and proliferation of dermatophytes is reliant on sulfite. Keratins have a sulfur-containing amino acid known as cysteine. Cysteine bonds are what stabilizes keratin and gives it a rigid structure. These fungi use cysteine to produce sulfite. Once the sulfite is produced, it clings to cysteine bonds and thus the process is repeated. The result is keratin that no longer has cysteine and it becomes brittle, misshapen and generally unsightly. There are several things that can increase your risk of having your nails infected by these little demons of destruction, such as diminished blood circulation, like in the case of peripheral artery disease; slow growing nails; injury to the nail; a weakened immune system; a family history of fungal infections; diabetes; and AIDS. Age and gender are also contributing factors- men tend to be more susceptible than women. Environmental conditions like walking barefoot in damp public places, humid or moist work environments, and wearing socks and shoes that prevent ventilation can also increase your risk. If you become one of the unlucky ones and your nails propagate these petite parasites, your treatment options depend on several factors. As mentioned before, dermatophytes are the most common cause, but there are other conditions and fungi (like the yeast candida) that can result in the same nail deformities. Your doctor will most likely need to determine the exact nature of your nail’s problem before determining the treatment. Once determined, if your infection is more localized, then topical anti-fungal agents like benzoic acid, Batrafin, or Nystatin can be tried. If your problem is more widespread, then oral medications that target specific types of fungi are usually prescribed. In the end, if your nails begin to yellow and you find yourself buying socks that match your sandals, hopefully the knowledge that half of people over 70 have the same problem will ease your mind. If it doesn’t, then go see your doctor and have your nails tested for the exact type of parasite invading them so you can potentially eradicate them and the unsightly nails they cause.